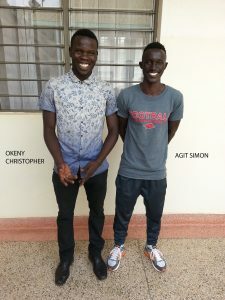 I am Okeny Christopher and I finished my senior 4 in 2017. From when I was a child, I wanted to become a doctor. My sister was working with Dettol (Soap making company), she was supplying different government hospitals. I used to go with her and I could see patients, so I got an interest in becoming a health worker. Initially you were not doing agribusiness, what were you doing before, how did you end up doing agribusiness? After senior 4, I decided to branch to a nursing school in Jinja and at first my parents didn’t agree because my grades were good, so they expected me to continue to the advanced level in Ugandan secondary schools. 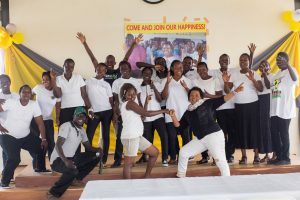 To reduce the burden of expenses on my father, I did an interview in order to get a government scholarship, prior to that I was sponsored by Reach Out Uganda but the program had ended. After that, since I was a good football player, I had a full bursary under football. After that, I had succeeded in getting the government scholarship and they had requested for 1 million Ugandan Shillings for requirements. I got this money with the help of two of my uncles and my father. But then my sister was to sit for her final paper before she could graduate, she hadn’t yet paid her tuition then my mother and young sister were sick, so my father had to use that money collected for my requirements. This culminated into me going to school 2 weeks late. I discovered that the school administration had given my place to someone else. 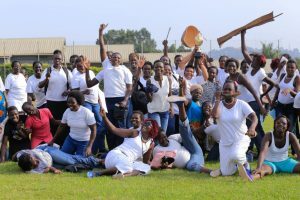 One of the instructors who saw me during the Interview told me that I could go and study at Mbale, the newly opened branch but no longer on government scholarship and that was going to cost more than two million shillings so I couldn’t make it. That’s when I started losing hope on that dream to become a doctor. I began doing small works as I waited for my father to return the money. During the time of election, I met Madam Teddy who was campaigning to become the LC1 in our area. She didn’t win. After the elections, she called us and invited us to go to Rwanda. I could not miss the chance! It was organized by Madam Rose and Teddy, we went to Kibeho were the Virgin Mary appeared to some students in a school. When we came back, I had no plans and hope, the money needed to study was about 3 million. So, I began to do work where I was paid in a range of 10-15 thousand Ugandan shillings. I always sent the money I got to the village to do some farming. I was doing agriculture in a minor way. 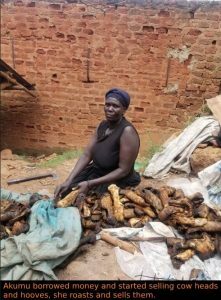 In the village we have fertile land so my mother always planted cassava and sweet potatoes, generally food crops and she sold to harvest in Kampala to earn besides making beads and crushing stones. So, I also acquired that skill from her and I also started planting crops in the village through the villagers. I did it for some good time and I was making some money. Was it hard for you to switch to Agri-business since you had other dreams? 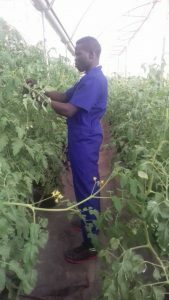 It was not hard for me to switch from my dreams of becoming a doctor to Agri-business. I had already started doing agriculture by sending money for farming to the village. If I fail to become a doctor to treat human beings, through agriculture I can still become a veterinary doctor for animals so I’ve never lost hope. I still have hope even if I had started losing it. So, switching to agribusiness has never been difficult for me. At Agromax, what was your typical day and week? From Monday to Friday, we followed the programs of Agromax. And in the weekend, we did our own activities. On Monday we had leadership sessions. I was a leader in the field of entertainment. So, I used to give reports of previous weeks on how my department was doing, we had 45 minutes for all the departments to give out the reports. Then we would go to the field, either in the green house or we could harvest. We used to harvest on Mondays and Fridays. Personally, I was given seven green houses to manage including one of; tomatoes, cucumber, sweet paper. Among the workers, I had friends who could help me. 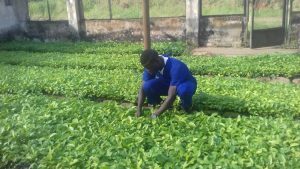 Among the students assigned to Agromax, I was the one with the greatest number of green houses to manage, so I had to befriend the workers so that they could help me. We could also spray and give fertilizers to the plants. On Tuesday we could do field work and on Wednesday and Thursday, we would have classes. What did you enjoy most during your field attachment at Agromax? I enjoyed the hands-on practice. Before I used to practice agriculture unknowingly, I could send money to the village for planting crops, during harvesting I could head to the village and then come back and sell the harvests. I used to hate handling a hoe. Now I can do all that, I work in different fields like greenhouses, now I can manage a greenhouse very well. We never only studied about being a good farmer, we also had life skills training as a person in the community. I have met friends, I met senior agronomists, business partners, I’ve met different people who sometimes call me to do for them certain tasks and my network is growing. My life has never remained the same. 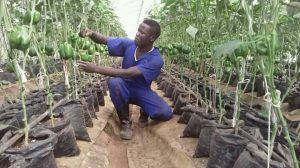 How did you end up studying Agri-business? After the trip to Rwanda, when we came back, we had a call from Aunt Rose and Madam Teddy. They wanted to meet all the youth who had traveled with them to Rwanda, so I took that chance to attend. So, I wanted to go and appreciate what they had done, I hadn’t asked to be taken to Rwanda but they still took us there. Rose had no information about our lives but she loved and cared for us. 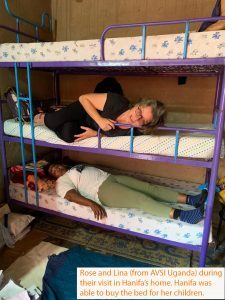 She wanted to hear from us the changes in our lives after the journey to Rwanda. They were asking us about our plans and goals. When I heard that, in my heart, I was saying, “Thank you God for what you are doing in my life!” Since I failed to get a scholarship from the government for the nursing course, I felt that I needed to do something better outside the bracket of football. I was waiting for her to tell me, “What do you want to be?” I wanted to do catering! But instead, Teddy recommended us to a special course, Agri-business. She explained more about the course. I looked at my life. I was sending money to the village to plant crops and this was a kind of Agri-business as well. So, this would help me adjust to what I was already doing. I used to read about it, for example having a small garden in the compound and earning from it, so I picked interest. We were many youths and people selected different courses but my friend Agit and I chose the Agri-business course. So, after that I went to Madam Teddy she explained more about the course. We joined COWA vocational institute and thereafter we were sent to Agromax. From then my life has never been the same. I appreciate my parents, Madam Chrispine of COWA, Mr. Alberto of MPI, my mothers and mentors Rose and Teddy. At the level where I have reached, I can do something of my own even if I am at the initial stages. 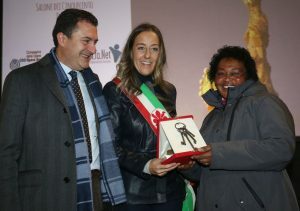 I would like to thank Meeting Point International! 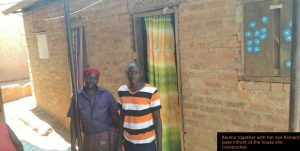 The story of how Akumu Olga built a house by borrowing money from her VSLA group. One day it rained a lot and my house collapsed but I had nowhere to go, so I just stayed in that house though it was in a very poor condition. My neighbours told me to move out of that house but I could not because I had nowhere to go. They even called the police, so that I could leave but I still couldn’t leave. I wished it could rain so heavily so that we all die at night because I felt worthless in this world, If God really cared about us then my house would not have collapsed. I could not sleep at night because I had to check on my children. This was because it was a dangerous period whereby they were kidnapping and killing people. The police again came and warned me, I had to move out this time. I decided to go and stay at my sisters’ place and she gave us a single room to stay in for a month. When the month elapsed, she told us to move out of her house because she wanted to rent it out and get some money. I then had no option but to go back to my old house that had collapsed, I used to cry a lot due to the tough situations. We would cook from outside and when it rains, we would sit on a neighbour’s veranda. 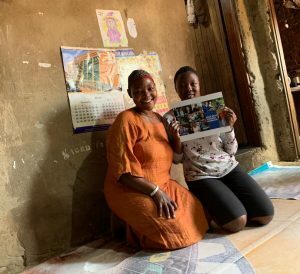 I had thought of going back to the village because the situation had worsened but my children persuaded me that we should stay because they wanted to study. 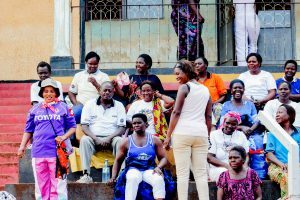 It was easy for me to get food because I would go to different markets like Nakawa and Banda market and people would have pity on me and give me food, I would also try and collect the leftovers that the market vendors had thrown. The main problem now was that of money, I had to go to different markets and collect tiny pieces of cassava and maize that were not needed and grind them to make flour and the remaining would be used to make alcohol (marua). It was from this point that I started getting some money because people would come and purchase alcohol. That is the money that I would use to buy food and also save to pay the school requirements of the children. 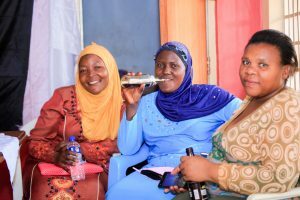 But the money I got from brewing alcohol was not enough so I would go to look for vegetables in different areas like Ntinda, Naalya, Kisasi and many other places, I would save this money in the Village Savings and Loan Association (VSLA) group of Meeting Point International. I could then borrow money and pay school requirements. As I kept on getting money from the activities like selling vegetables and alcohol, I would return the money that I had borrowed. I again borrowed money and started another activity of selling cow heads and the hooves, I would roast it and sell it to the people in Kitgum, I would deliver it through the bus and a relative in Kitgum would sell it for me and send back the money. This house that I constructed I consider it a gift from God. When they demolished houses from Naguru Barracks, a friend of mine informed me about it and she told me that people were collecting the bricks from there and selling them because they were good, they were used by the British back then in the colonial era. 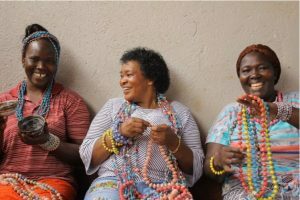 Many women were collecting them and selling them to the wealthy men who came with trucks to buy them but me I knew God had answered my prayers, so I instead collected them to construct a new house. When I had collected many of them, I ran to my VSLA group of Meeting Point International and they lent me 200,000ugshs, I also went to my sister who lent me 300,00ugshs which I used for transporting the bricks at home. I brewed more alcohol and paid back the loan I got from my VSLA group. I then borrowed more 500,000ugshs from them (VSLA group) I used part of it to collect more bricks and part of it for buying sand. I have a gentleman who is my neighbour, some years back he had requested me for a small piece of land to construct his toilet and I gave it to him without any pay, he again requested for more land to build another toilet, but this time around, he decided to give me 1,000,000ugsh as an appreciation for being kind to him. With that money, I was able to buy two trucks of sand and 13 bags of cement, then I got some boys who were builders to construct the house, I paid them 400,000ugshs. I did not have iron sheets to use, I decided to use the old ones. As the construction was going on, we ran short of building materials, I again had to go back to Naguru to extract more bricks so that I could sell them. I managed to get 600,000ugshs to buy the remaining materials. The iron sheets leak at times but my elder son tried to glue it, it has not helped much but I know that in the future again, I will be able to buy new iron sheets. So that’s how I was able to construct my house, I put in my all and I was disciplined with the money because I had learnt the value of money. 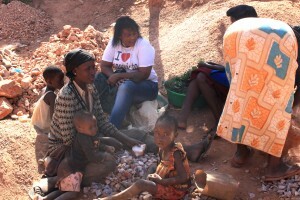 Before my children were being paid for by Meeting Point International, we all used to go with them for stone quarrying, no one was going to school until one day my elder son Robert went to play football and he met Rose, who asked him why he was not at school, he told her that “my mother doesn’t have money to take us to school”, she asked for my name and after Rose took his photo. After a while Rose came to the place where we were doing stone quarrying from and she came with the photo of Robert asking for the mother, I was not around but my friends later informed me that the director of Meeting Point International was looking for me, I had to go and meet her and she told me that Robert would begin school, she also asked for my other children that were not going to school and she enrolled them too. After a while, all my children were going to school. Besides all this, am so happy that because of Meeting Point International, my children are studying, if Rose had not supported them I would count myself useless because I would not have been able to educate them at school. Am confident that my children are having a good foundation because they are studying from Luigi Giussani schools, although in the future they go to study somewhere else, their foundation has been laid firm. Am also happy that through the VSLA initiative at Meeting Point International, It helped me to construct my own house when all hope was lost. It’s a two roomed house, I rent out one room and the other I live in it with my children. I put in my all and I was disciplined with the money because I had learnt the value of money. Hanifa with one of her daughters. I began working here at Meeting Point International when I didn’t expect it because I did not go to school. There was a day when I went to see Aunt Rose to check on her, then she told me that there was a job. I thought that only people who knew how to speak English could have gotten it. I needed it but I didn’t expect it, but Aunt Rose told me that I was going to have it (Cleaning at the MPI office and supporting the staff). I couldn’t believe it, but she was serious about it. 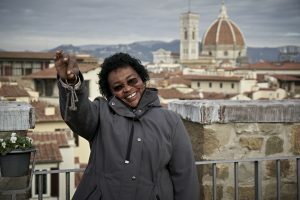 And she took me to Alberto (Technical Advisor at MPI) and I was imagining how I was going to speak to him because I couldn’t speak English, but he didn’t have problems and I was cleared to work. I had to set up the National Social Security Fund (NSSF) account and the bank account. I started to work and I even saw my name on the list of employees at the office, it was like a dream for that whole week, I couldn’t believe all this was happening to me. I started working on 15th May 2018. When the month ended, I was paid for the days I had worked!!!! I went home very happy, my children were very happy and we bought food, we bought things that were needed at home. I continued working and another month elapsed, my payment was made in my bank account. I even saw the notification of the payment to my account on my phone, I was so overjoyed. I even saw the message from NSSF, these were things I only saw on television and I knew that it was for people who went to school. Now me too I could be paid on an account, am also on NSSF. Aunt Rose gives me salary for my work, but even if I fall sick, she doesn’t think of the salary that I got, but she still takes me to the hospital and pays for my medical expenses. This surprises me so much. Even when am sick and the treatment costs Ugandan Shilling 20,000/=, she still pays for it, without deducting it from my salary. She is very different. When I think of what she has done to me, I start to tear, because she really changed my life. My children now study, I can pay for their scholastic requirements, and I can buy for them books. My child used to stay home for up to two weeks without studying because she was sent away for not having an exercise book that costs 3,000 shillings. But now I can buy the books, I can give her the school requirements. When I get home I can buy food, soap, sugar. By the time I was joining MPI, I couldn’t even remember the price of a kilogram of sugar, I used to take tea without sugar. In my whole life on this earth, no one has loved me to this extent that Aunt Rose has. My children are happy, they don’t go to bed without eating. They can wash their clothes, those days we used not to have soap, we couldn’t afford it. The children could only wash their uniforms on Saturday. My child wanted to commit suicide, she hated herself and was fed up of her condition. She wanted to study but couldn’t. She even asked me what her future was. She was going to Kololo (a government school) and she was always chased. Whenever they chased her from school she would hide in the toilets and then return to class when they had stopped chasing children. She never got her report cards whenever the terms got done because she hadn’t paid school fees, she was living in that kind of situation. Now all of that changed with the help of MPI. My child is at school studying and I can now pay for her scholastic materials. This is the first thing I did when I get my salary so that my child could study. I now feel that I have also a pillar that I can lean on. When I fall sick I am not worried. When I fell sick, I felt that I was only left with dying. But when I joined MPI, I got hope, I felt like I am a person, alive. I don’t need to be reminded to take medicine, it just comes to mind that I need to take drugs. I live near a trench, the muddy water is always flowing. But Aunt Rose stills comes and sits in my home in spite of that mud that flows near my house. This makes me wonder so much! I am a Muslim but she treats me like the other workers. My hope and that of my children has been returned. I went to Nsambya Hospital in Kampala, I had never gone there. When I arrived, I handed in my documents of referral, the doctors treated me and they gave me receipts. I felt like a boss even when I didn’t have money. I was cared for in the hospital, the doctors checked me thoroughly and all of this was possible with the help of MPI. Those days, no one wanted to treat me because I didn’t have money, I couldn’t have reached that hospital if it wasn’t for MPI. The only thing I can do to thank MPI and Rose is to pray for them so that God may continue giving them life. My husband used to give me Ugx 5000/= shilling (approximately €1.5) daily to buy food, charcoal, sugar, to buy soap and this wasn’t enough. These days even if he leaves home that amount of money, I don’t care because I am now earning and I can buy necessary needs for our home. I am so happy for all the help that I’ve received. Happy New Year mom, we are very pleased and grateful to God to have someone special like you. The main reason for writing this letter is to say “Thank you, mom.” As a lovely mother, you have given us the best gift a parent should give to her child. That is education because nowadays academic qualifications are really considered for one to get a good paying good and you have given us a go ahead. We really appreciate you and Madam Teddy for this gift because personally, I had lost hope but now at least I feel and see myself as someone of great honor. In seven years to come through Agri-business. You have shown as the way and we promise not to disappoint you or ourselves or even forsake the course because with the 3 months training, we have seen the greatness in it and we are ready to continue with it if the chance is still there. We have tested and seen the good part of it and the bright future it can impact our lives. And we believe to be good examples to other fellow youth who undermine the courses (such as agri-business). We are very glad for this opportunity. Through your actions, we have also picked out something and that is sharing. We can’t do it perfectly as you but we shall try our best. May the Lord richly bless you together with Madam Teddy for the great work with peaceful hearts full of love that you are sharing with the youths, elders and many others. Now we don’t have anything worthy that we can thank you with but we believe our prayers with a faithful heart through the Virgin Mary will do more than any other thing. May God bless the works of your hands, families, friends with healthy life and minds full of peace, joy and happiness.